BANGKOK—Global stock markets slipped on Thursday after a survey showed Chinese manufacturing hit a four-month low in March, underscoring a slowdown in the world's second largest economy. Benchmark oil fell below US $107 per barrel. The dollar rose against the euro but fell against the yen. Investors fretted over the economic outlook after the preliminary reading of a Chinese manufacturing index compiled by HSBC fell to 48.1 in March from 49.6 in February. Figures below 50 indicate that manufacturing is contracting. “Sentiment is likely to weaken in Asian and global markets today and may be suppressed for a few sessions,” he wrote in a report. European stock markets sank in early trading. Britain's FTSE 100 fell 0.3 percent to 5,876.88. Germany's DAX lost 0.3 percent to 7,049.95 and France's CAC-40 shed 0.5 percent to 3,509.64. Wall Street appeared headed for losses, with Dow Jones industrial futures down 0.2 percent to 13,042 and S&P 500 futures shedding 0.2 percent to 1,394.50. Asian stock markets swung between gains and losses as a mixed economic picture emerged from the region. The Nikkei 225 index in Tokyo ended 0.4 percent higher at 10,127.08 after Japan announced it had posted its first trade surplus in five months in February, on a recovery in auto and electronics exports to the United States. The announcement touched off a brief flurry of yen-buying that pushed up the Japanese currency, Kyodo News agency reported. Hong Kong's benchmark struggled for direction. 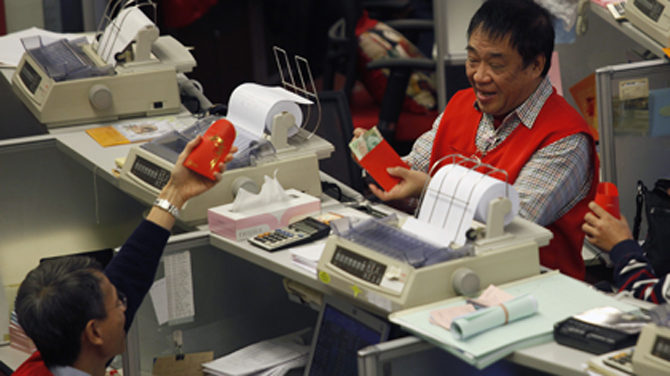 After vacillating throughout the day, the Hang Seng closed up 0.2 percent at 20,901.56. Financial companies helped lead Australia's S&P/ASX 200 into positive territory with a gain of 0.5 percent to 4,273.70. South Korea's Kospi lost 0.2 percent to 2,022.35, with shipping-related companies weighing the benchmark down. Hanjin Shipping Co. tumbled 8.4 percent and STX Offshore & Shipbuilding slid 6.1 percent. Mainland China's benchmark Shanghai Composite Index slipped 0.1 percent to 2,375.77. The Shenzhen Composite Index lost 0.2 percent to 969.98. Steelmakers across Asia fell on the weak China manufacturing figure. South Korea's POSCO fell 1.3 percent and Japan's Nippon Steel Corp. dropped 1.3 percent. Benchmark oil for May delivery was down 19 cents to $107.08 per barrel in electronic trading on the New York Mercantile Exchange. The contract rose $1.20 to finish at $107.27 per barrel in New York. In currencies, the euro fell to $1.3194 from $1.3204 late Tuesday in New York. The dollar fell to 83.16 yen from 83.47 yen.